While I haven't owned one of S&W's original Military and Police pistols, I have shot them, know the performance and value of them, and own/carry a Shield .45 in that line. That said, this Smith and Wesson, Military and Police M2.0 9mm is a definable improvement on the original line that cannot be denied. 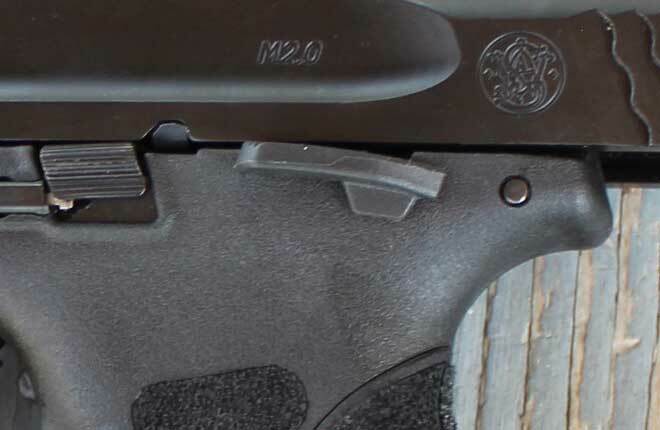 That means the other M2.0 Pistol calibers and models, with or without the flip-up thumb safety, are all improvements in the M&P stable of pistols. "Improvements" in them means features that make the guns handle and perform better. Not the features that are just my personal preferences. The 9mm pistol I chose has an ambidextrous 1911 style flip up safety. The gun comes in models both with and without it. If you get it with the safety and decide you want to remove it, the process is not complicated. With a call to customer service Smith and Wesson will send two plugs to you. They will allow for the proper replacement of the internal parts removed during the safety removal process. Handling the Smith and Wesson M2.0 9mm gun in the store, I immediately liked the beefier feel of it. The back strap that came on the grip was fine for my hand, but the gun comes with a total of four, including the one installed. The back straps can be removed and installed in a snap. On the bottom of the grip is a small peg that can be twisted slightly to remove one, and install another. All the back straps make significant changes in the grip's size and shape. Something to accommodate most anybody's hand. Location of controls on the gun are typical and will be familiar to most people experienced with semi-auto pistols. The slide stop on the M2.0 is not really designed to use as a control to drop the slide on a first round. It is flush against the side and somewhat difficult to manipulate, making sling-shotting the slide a better option generally. That doesn't mean you can't use the stop to drop it. It's just not well suited for it. 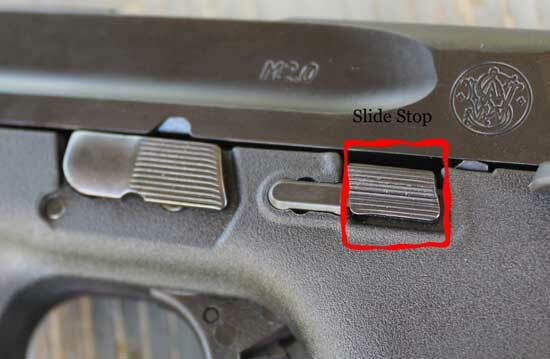 There is a unique plug beside the slide stop presumably to keep the stop decisively pinned in the down position until the last round is fired. 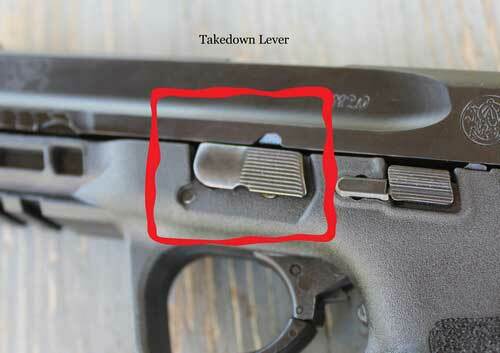 The take down lever on the gun is in the typical place. The gun can be easily taken down by racking the slide and locking it back. The TD lever is rotated down. Then the slide released forward. At that point, you can pull the trigger to complete the take down. 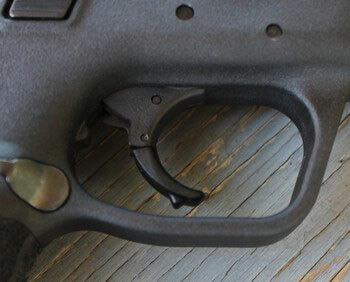 Alternatively, there is a small lever in the frame of the gun you can access through the top of the open slide. It can be pulled up with a knife or small screwdriver to take the gun down without pulling the trigger. A feature of the M&P line that doesn't make a lot of sense, but it's there and just amounts to a minor annoyance. Sights on the gun are 3 dot, with both the front and rear sight being windage adjustable. 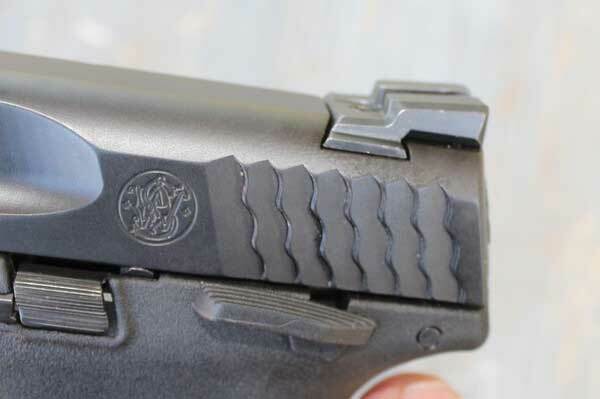 True to tactical pistol styles used for police work or self defense, the rear sight is stair-stepped to allow for one hand slide manipulation if necessary. 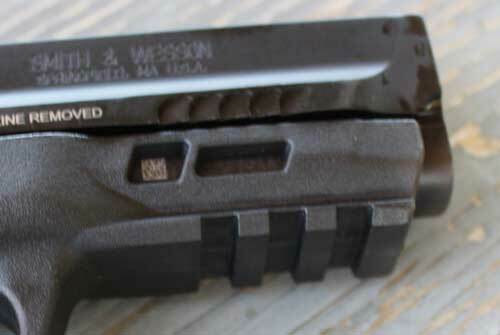 In the picture you can also see the aggressive rear serrations. These are truly functional, giving a good grip for slide work. 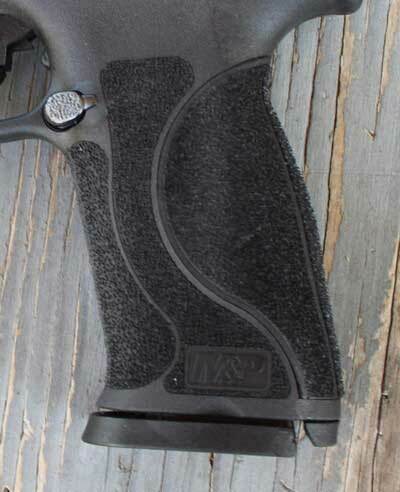 The aggressive texture of the grip/back straps is now typical of many of Smith and Wesson's handguns in the M&P line. With this texture, you won't have any trouble keeping your grip on the S&W M2.0. It's like grabbing a grip with the texture of 60 grit sandpaper. The only downside to the grip texture is that you will need a protective backing on any IWB holster you may wear without an undershirt. The grip rubbing against your side will be beyond ignoring. The frame of the gun now contains some metal reinforcement to increase the rigidity of the gun. There are some cut outs on the front of the frame that provide a small window to the frame reinforcing material. This is the part you've no doubt heard the most about. 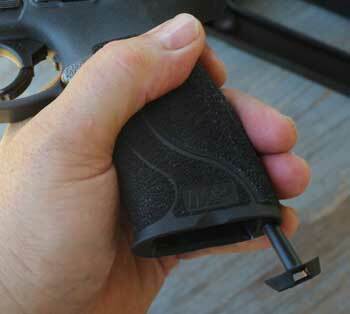 The new, shorter, lighter, crisper trigger pull, with short audible reset. This is what every striker fired gun manufacturer is going to have to start considering with Smith and Wesson providing this kind of trigger pull out of the box. With that and the appearance on the handgun scene, of the Turkish made Canik, reviewers are raving over the triggers. There is going to be no avoiding it from other manufacturers. By the way, if you've been affected by some reviewers whining and exclaiming loudly about the jointed trigger and how much they hate it; it's utter nonsense. When you're shooting the gun, it has no effect on the operation, function, or the your performance with the firearm. We now know from this S&W handgun that any handgun manufacturer can provide a trigger that allows shooters to shoot faster, more rounds, and more accurately. But not with an aftermarket trigger. Right out of the box. The trigger pull on this particular gun breaks right at 6lbs on a Wheeler Trigger Pull Gauge. But it's not the weight of the pull that's important here. It's the extremely short pull and reset. When you start shooting, the impression is that my finger is barely moving back and forth. There is a no-resistance takeup of about 1/2 inch before you reach the pull point. After that, it's nearly effortless. If all you've used are striker fired handguns with the typical long, mushy pull, once you shoot this type, you won't want to go back to anything less effective. Especially when you know this type trigger can come straight from the manufacturer. Shooting the Smith and Wesson M2.0 9mm pistol was like most when first starting. A little time spent on some paper targets allowed me to get a feel for the gun, and see how the sights were aligned. Turned out, if I did what I knew to do, everything about the gun was right. You can see in the picture below, shooting the targets from left to right, how it improved as I got acclimated to the gun, grip, and trigger. Don't really need to put up a bunch more target pictures. It took a few magazines to begin confidently grouping the shots, but once I was on target, it didn't take a lot of effort to check the gun for practical use. I shot combinations of paper, static steel, and a hanging steel silhouette. The video shows how it went and how the gun performed from sighting it in, getting confidence in the shot placement, and finally into the tactical use. The gun chewed up and spit out any type ammo fed into it. I used Blazer Brass 115 gr, Blazer aluminum case 115 gr, Monarch steel case 115 gr, Independence aluminum case 115 gr, and Fiocchi brass case 147 gr. A few times I mixed some of it up in the same magazine just for fun. No problems. Slow shooting at paper targets, moving and shooting paper and steel, static shooting moving my body from side to side with no foot movement, and finally rapid fire. The gun took it all in stride. My gun is the 9mm model with a 4.2 inch barrel, and a flip up thumb safety. SUMMARY REVIEW: The commercial handgun market has been in kind of a limbo for some time now. Manufacturers have added "features" that have done little more than give them some kind of slight advertising advantage. Back and forth with no real significant performance enhancements. This gun, with it's beefed up frame and feel, the radical, aggressive grip texture, and most impressive, the short, nearly effortless trigger pull, puts it ahead of the pack in comparison to most striker fired guns right now. The handgun holds 17 rounds in the magazine. As I have written and assembled this article throughout the day, I have carried the gun around town, comfortably in an IWB leather holster. Even though it is a full size duty pistol. 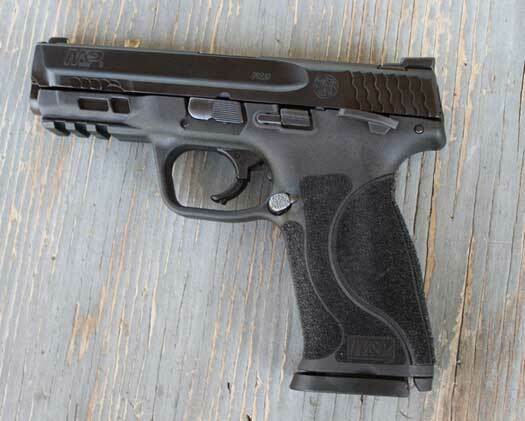 This makes the ongoing saga of the Smith and Wesson M&P line of handguns one that continues to produce winners, one after the other. 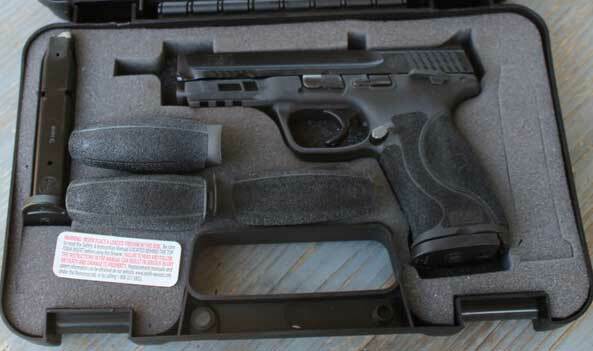 I anticipate S&W modifying more of their striker fired guns with features from these M2.0 pistols that are bound to be demanded as more people use them. 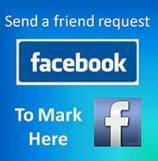 In the meantime, you would likely do well to grab one in your chosen caliber. Like I said in the video above; so far, the M2.0 is a winner. Glad to have mine in the holster.